Trader Joe’s was made for lazy people. I’m always bamboozled by the latest and greatest pre-cut veggies they have in stock. There’s the bagged organic kale all chopped and ready to go kale chipping, the mirepoix ready to be thrown in your next soup and then….AND THEN….there’s the chopped butternut squash and sweet potatoes. I’ve already died and gone to heaven over the chopped butternut squash. It’s actually more like a safety precaution considering the chances of chopping a limb off when attempting to cut a butternut squash is about 90%. Butternut squash should have a warning label. But the chopped and peeled sweet potatoes?? HELLO! Lazy people unite! In an effort to save you from hours on end of frustration and permanently pink clothes, TJ’s also sells pomegranate seeds. They ain’t cheap, though. Whole pomegranates cost $1.50 and the package of seeds costs $3.99. I’d rather spend four dollars on a couple cappuccinos or a vat of hummus, so I went for the whole fruit instead of just the seeds. …And the pre-chopped butternut squash, obviously. 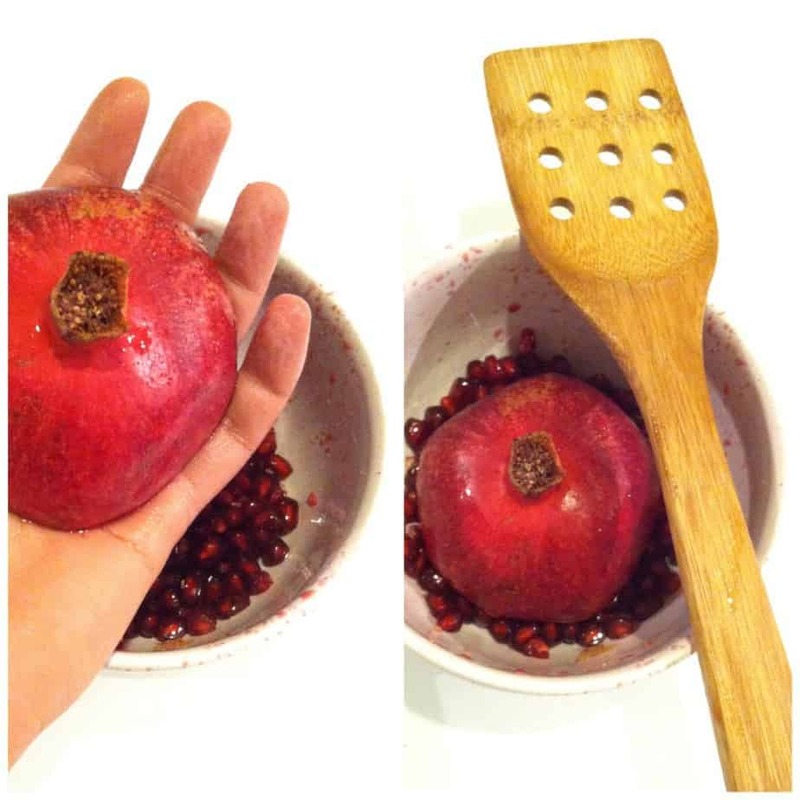 De-seeding a pomegranate can be an extremely frustrating task. If any one ever told you to slice it in half and put it in a bowl of water to remove the seeds, they were VERY wrong. Shame on them for putting your through that torture (ahem, my father). What you should do is slice that sucker in half, hold one half in the palm of your hand and using your other hand, whack the hell out of it with a wooden spoon. The seeds will fall right out and leave that annoying white membrane behind. You may want to watch this video for the whole demo. It’s a keeper. 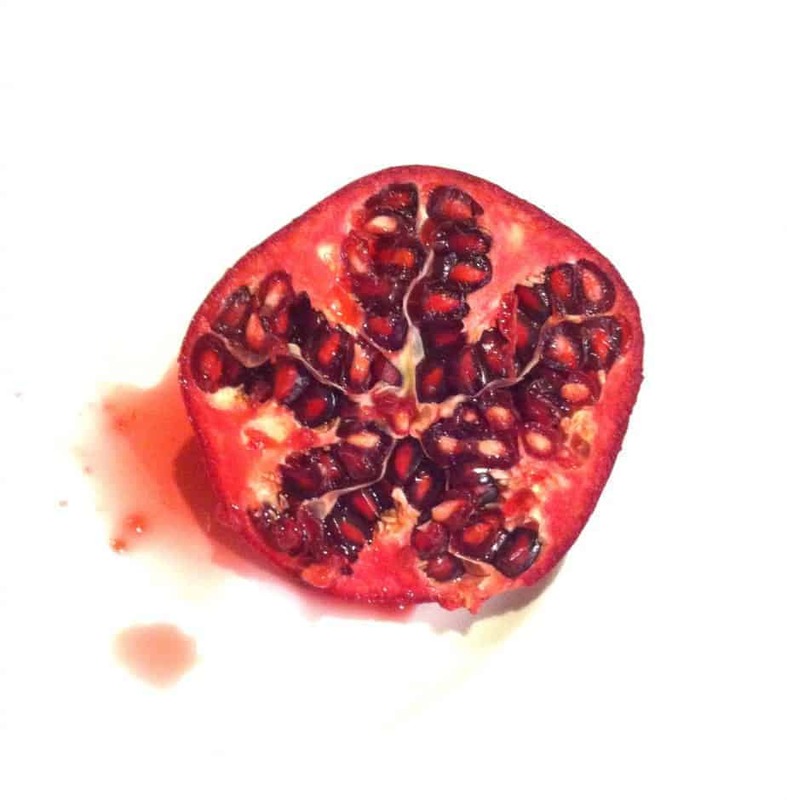 You need to be very angry before you de-seed your pomegranate. You need to have stepped in dog poop not once, but twice. In one day. Yeah. I know from personal experience that that’ll do the trick. Smack that thang!!!! 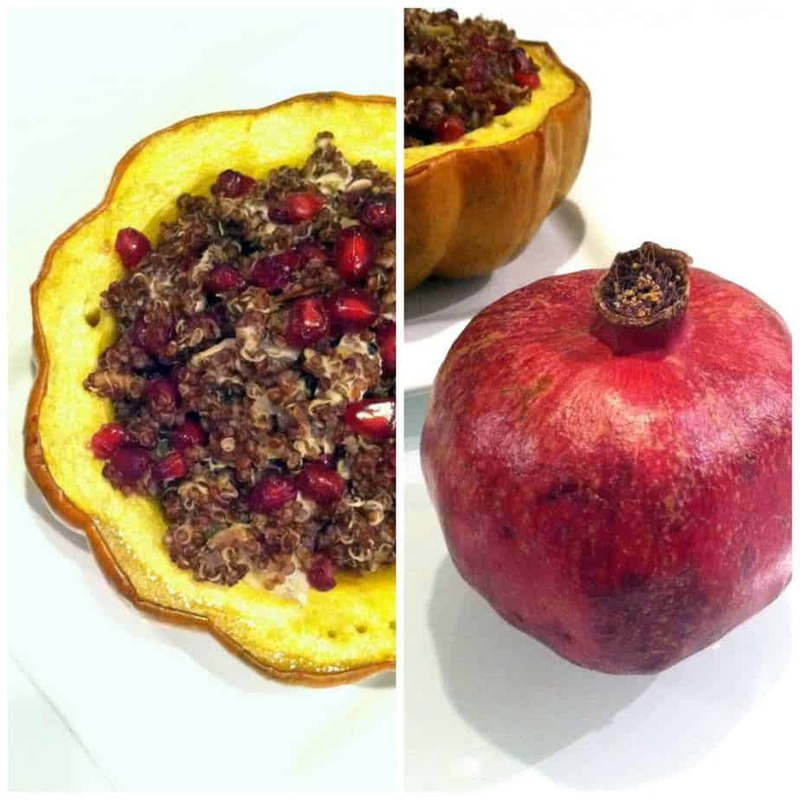 You’ll end up with an oh so lovely bowl of pomegranate arils just begging to be stuffed into roasted acorn squash with mapley quinoa and goat cheese. Ummmm duh. The quinoa stuffing is so freaking delish that you could easily eat it on its own, with or without the squash. 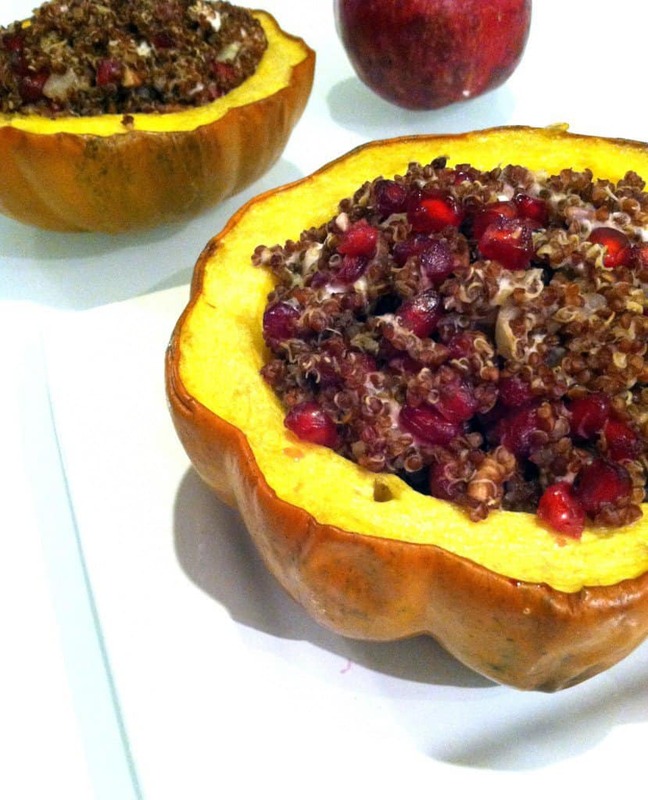 Roasted acorn squash stuffed with maple quinoa, pomegranate seeds and creamy goat cheese. Pre-heat oven to 400F. Slice squash in half, scoop out seeds and discard or save for roasting. Place squash halves cut side up in a baking dish filled with 1/4 inch water to avoid burning. Spray/brush both sides with olive oil and sprinkle with salt. Bake for 50 minutes. Meanwhile, rinse quinoa and add to a small pot with water. Bring quinoa and water to a bowl, and then reduce heat to low and simmer (covered) until the water has absorbed, about 15 minutes. Set aside. along with the pomegranate seeds, pecans, maple syrup and salt. Fold in crumbled goat cheese. Spoon quinoa mixture evenly into roasted squash halves (you may have some leftover) and bake for 10-15 more minutes. Serve hot. This is by far the best description I’ve heard to cut open a pomegranate! First of all, I absolutely love that you managed to throw bamboozled into a sentence ;) Second of all, this is just making me lament the fact that we don’t have a TJs up here even more. Third… I need this squash in my life, like, yesterday. Holy.delicious. You know my thoughts on squash cutting! I buy pomegranate seeds from costco for cheap. They’re awesome. I commend you for your seeding efforts though. Shall I add this to the thanksgivukkah menu? I think yes. Hummusqueen, this recipe….Its a combination of the sweet, salty and everything all in one! amazing! The stupid kabocha and butternut squash killed my first knife. I showed them who’s boss by buying a meat bone cutting one from Ikea. Winning. You take the BEST pictures!! I need lessons ;). What a fabulous recipe! It has all my favorite ingredients; not to mention, that it looks so pretty too! Pomegranates are both my love and nemesis; I’ve lost track of my ruined clothing items!! I was one of the lazy people who bought the pomegranate seeds shelled and have been topping them on toast and tj’s Mediterranean hummus. Oh the joys I get from eating that combo!! Can’t wait to try this!!! Top it with some TJ’s balsamic glaze….OMG. I wish I wasn’t a meal planner because I totally want this for dinner this week!! Definitely pinning this for later. Can’t wait to try it! I need to be more of a meal planner! Do you use a certain program or do you just go through blogs and cookbooks and write down meals for the whole week? I would save so much time and money at the grocery store if I planned ahead. YUM! 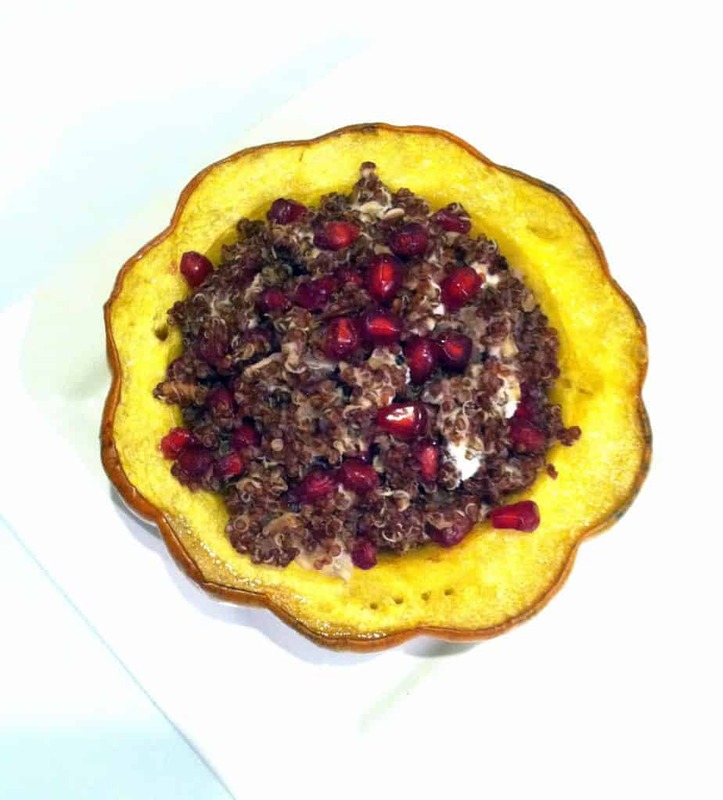 I am loving the combination of goat cheese and pomegranate! Thanks, lady! It’s a match made in heaven. Great idea to bake it a little before cutting! This recipe was a giant hit with my family at Christmas! I forgot to buy a pomegranate, so I ended up using craisins, which was also delicious. Thanks for the recipe!